Welcome to "Four Seasons Escape". A vacation in the woods with all the comforts of home and then some! This very private home is sure to fulfill your expectations of mountain living with its location. Surrounded by tall trees and all the beautiful sounds of nature you will find it serene and welcoming! Spend quality time with your friends and loved ones in the open kitchen and living areas while playing board games, cards or just catching up with each other. If the games are getting too rowdy head out to the large game room in the garage for some ping pong or pool! Wind down at the end of the night in the peaceful hot tub while gazing at the stars or curl up in front of the fire with your beverage of choice. 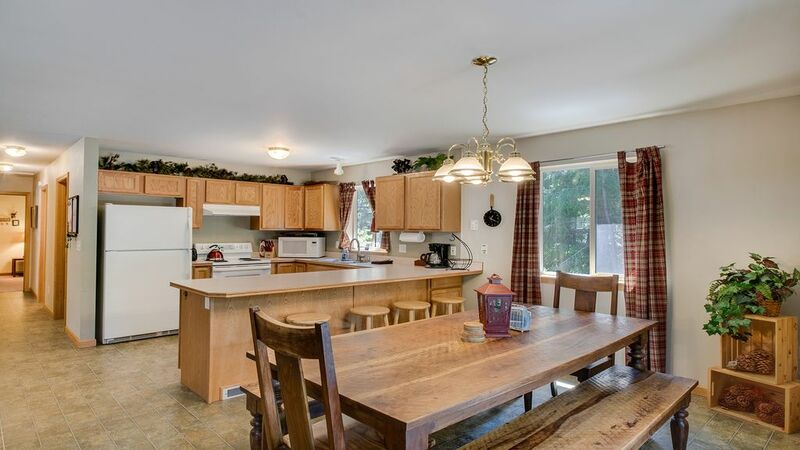 Located minutes from Lake Wenatchee State Park and a short drive to downtown Leavenworth or Stevens Pass Ski and Bike Resort this home really does have it all. There is no air conditioning, but fans are provided for your comfort. All the comforts of home and more in this private forest setting. A great base camp for adventures or a wonderful home to enjoy time with friends and family. Located in a small forested neighborhood centrally located in the area to many outdoor activities and the town of Leavenworth Washington. Table easily seats 8 with a breakfast bar nearby that has 4 stools. There is plenty of room for walking around the property but there is no irrigated lawn. The home is all one level but there are 3 stairs to enter home. Excellent accommodations, well thought out floor plan, decor and details. Would love to stay again. We're so glad you enjoyed your stay in the mountains! Thank you for your great communication with us regarding the hot tub and we're so glad we were able to resolve the issue and not impact your stay! We would absolutely love to have you and your family stay at any of our managed homes in the future! The house was very clean and spacious. We were able to play ping pong while we were there too. Over all we really enjoyed our stay there. We are glad to hear that you enjoyed your stay at this home and found it to be clean and spacious. We strive to create a wonderful guests experience and it sounds like we succeeded! Thank you so much for the kind review and for being our guests. This was such a lovely place to just BE for our annual girls weekend. From the well appointed kitchen that allowed us to nourish our bodies to the peaceful solitude of the property, the coziness of the couches and the toasty fireplace to the perfectly delightful hot tub - this property is a winner. If you are looking for a place to recharge and restore yourself I highly recommend this wonderful home. We didn't miss a thing with this conveniently located home away from home. A short drive to the slopes and back home again for a relaxing hot tub soak and a cozy dinner and movie. The house was very clean and well-kept and had extra amenities (e.g., hot tub towels, toiletries, hairdryer, laundry & cleaning supplies, utensils, hot cocoa, tea, coffee, and games) which made it simple to unplug for the week as a family. The home is tucked away in a quiet community but nearby is an espresso stand, gas station, and two restaurants so you need not worry about a thing. Home was very clean and comfortable. Beautiful setting. My wife was sitting in the porch swing and watched a coyote walk down the road (he had no choice but to use the road as there was at least a foot of snow on the ground). We truly enjoyed our stay and would recommend it to anyone wanting to stay in a forest setting that is still close to Leavenworth and all it offers.